One way they have done this is to offer very cheap call rates within their own network, but then make calling other networks considerably more expensive. This has opened up a microbusiness opportunity. 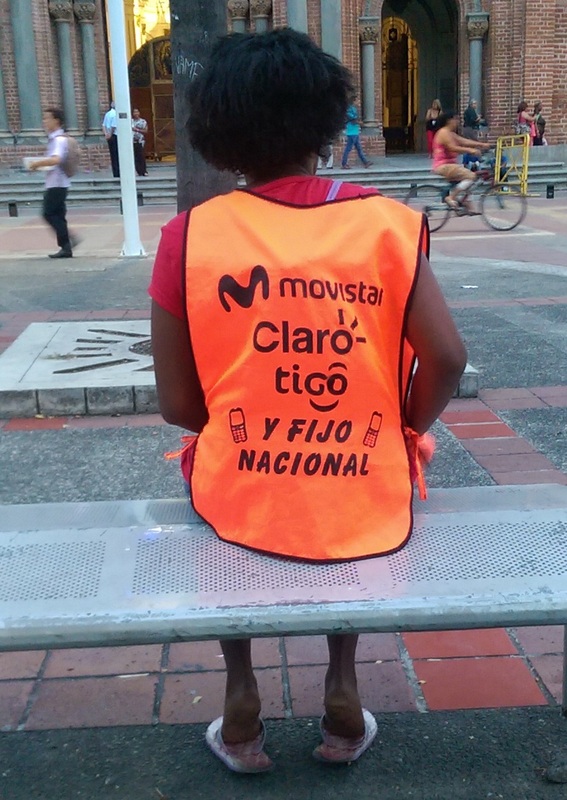 Loads of Colombians have invested in some cheap mobile phone handsets, bought SIM cards for the various networks and set themselves up on the streets selling minutes to “todo destinos” for a small profit. You go up and tell them the mobile number that you want to ring. The first few digits indicate which phone operator the number is on, so they can choose the phone on the same network to ring from. They are absolutely everywhere and offer a good service, so long as you don’t mind the world knowing your business. These men and women are everywhere in Colombian cities. The basic gig seems to be that of informing people where there are parking spaces on the street and guiding them into them (hence the hankie waving). Additional services include?security and covering car windscreens with cardboard to shield them?from the heat of the sun. The latter service is also provided to moto drivers for their seats. 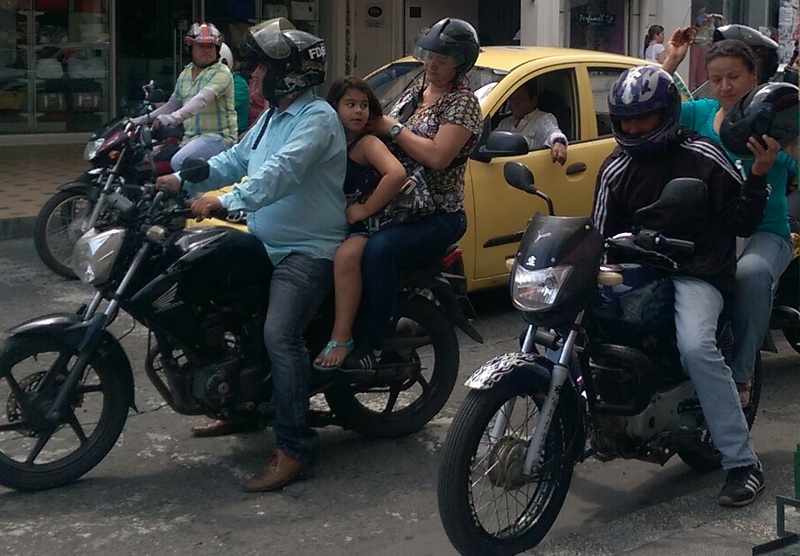 Motorbike taxis. As far as I can tell they are completely unregulated. If you walk past most junctions in the centre of town there will be a group of men and women offering to give you a ride on the back of their motorbike. One of my colleagues, Karen, is a regular user and quite a lot of the kids catch them to school. To my mind the whole thing looks ridiculously dangerous, especially considering the state of Colombian roads and driving skills, both of which are in a very poor state of repair. I have seen quite a few accidents while I have been in Colonbia. Every single one of them has involved a moto. Today I asked one of the students why she was limping. After much broken English and demonstrative body movements it turns out that she fell off a moto. Colombian buses definitely have doors. I know because I’ve checked. However, I’ve yet to encounter a situation under which it is considered necessary to close them. On buses that go a longer distance, typically between towns and cities, someone is often employed to hang out of the door frame and shout the destination out at people on the street. This raises a number of questions. Why not just make the destination sign in the bus window bigger? How am I supposed to hear this and jump on the bus when it is hurtling past at 40 mph? How on earth has that person got perfect hair when their job is to hang out of a bus all day? On occasions an intercity bus will stop outside a shopping mall, supermarket or other centre where people gather and roam amongst the shoppers shouting “Buga, Buga” or whatever their destination is. This can be a little unsettling before you realise what is going on. Palmira has its fair share of gated communities up in the posh areas of Las Mercedes and Altamira to the north of the city. But there are also companies that offer Vigilancias who look after the houses on a block or two of the city. They patrol those blocks overnight each night for a relatively low cost. Our Vigilancia is Jaider. He works seven days a week and in over four months we haven’t known him to take a night off. It is, as he says, a tough life. Every now and then during the night I am awake and I hear a whistle blow. It is Jaider letting us know that he is out there and all is well. Thank you Ali, that’s very kind of you to say. I have another couple of “Odd Job” posts to come, so watch this space …..
It’s all very hectic and confusing, but at the same time I seem to get around a lot quicker than I do in Brum!